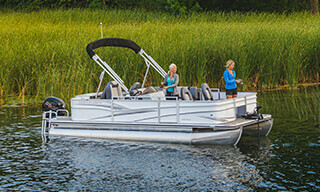 Introducing the brand-new Sprint pontoon, an entry-level pontoon that’s ideal for novice boaters and those looking for on-water versatility at an impressive value. 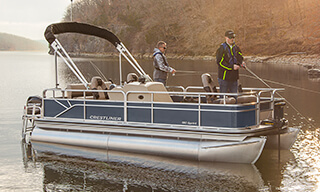 Each model features something no other similarly priced pontoon can deliver, Crestliner durability and reliability. 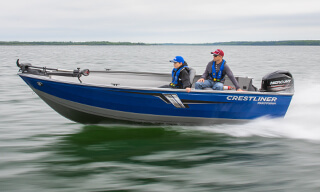 The Sprint comes in three lengths: 16, 18, or 20 feet and is available in either a Cruise or Fish & Cruise floorplan. Whether you are casting or catching rays the functional and affordable Sprint is outfitted for your adventure. The Fish & Cruise floor plan maximizes floor space to allow anglers multiple places from which to cast. 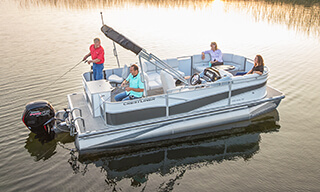 Up front, port and starboard Deluxe fishing seats provide comfortable seating when traveling from spot to spot on the water. On each side, within reach of the seats, are storage compartments with drink holders. 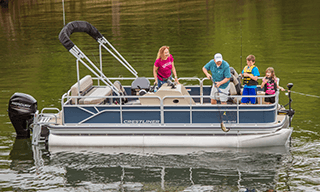 A 15-gallon, aerated livewell is standard on the Fish & Cruise floorplan as well as comfortable Deluxe helm and port passenger seats. 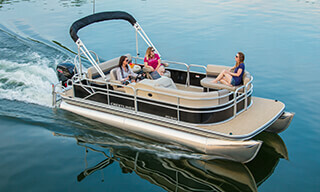 A rear stern lounge bench accommodates multiple passengers and features convenient under-seat storage.